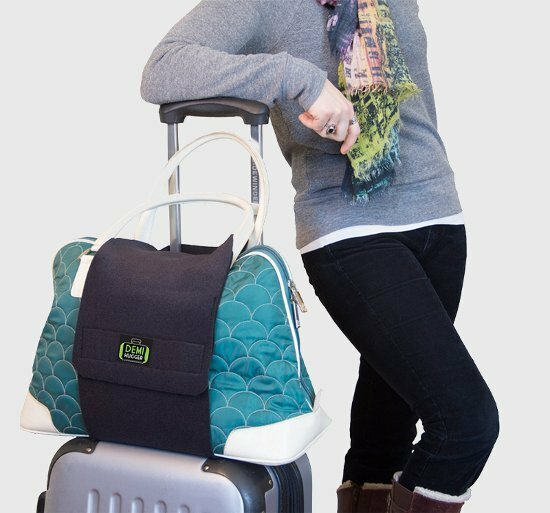 Demi Hugger’s Luggage Buddy Makes Your Travel Easier! Whether you travel by air, sea, or land, the Demi Hugger is your helping hand. The hugger will neatly stack your blanket, bag, or backpack to help you get where you’re going, without your arms overflowing. I am on my way to Orlando to attend the ASI trade show. And once again I am thrilled to have my Demi Hugger with me! I store it in the outside pocket of my roller case so it is always handy. I am in Denver, used it and loved it. Thank u so much. Hopefully our paths will cross again real soon. I use my Demi hugger with my carry on suitcase. I strap my pocketbook and coat on top. It leaves one hand free so I can use a cane. It is very helpful. Excellent addition to a guy who travels all the time! Now I don’t have to struggle with trying to hold all of my bags together as I’m running late through the airport as usual! I travel to South America several times a year, but this time it was different. It was easier! The Demi Hugger really came in handy with my additional luggage safely strapped to my carry on handle. I definitely will buy one when they come out. The Demi Hugger is the result of searching for and designing a product that would ultimately solve our travel problems. When traveling I had trouble carrying a heavy shoulder bag containing necessities like makeup, wallet, ticket, passport, medications, snacks, and wet naps while wheeling my luggage.The bag would slip off and empty on the ground. I observed many others having the same problem with items like backpacks, pillows, blankets, shopping bags, and baby bags. I knew there had to be a better way. After experimenting with several combinations of fabrics and designs while consulting with both travelers and manufacturers, I am truly ecstatic about the utility and simplicity of the final luggage strap. It has tremendous flexibility to support so many combinations of luggage and travel articles with ease and comfort. Fill out the form to receive an instant promo code to save 20% off of your Demi Hugger.